Men's Domed Grooved Wedding Ring : LOVE2HAVE in the UK! A men's two-tone wedding ring and one of the more unusual wedding rings we feature also. 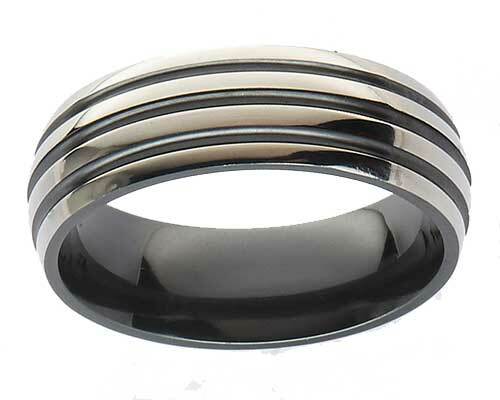 Here we have a 7mm width, domed profile zirconium ring with three black grooves shown here in a polished finish. The black grooves across the width of the band come evenly spaced from one another and go all the way around the ring as they have been machine engineered to catch the light. Not only is there a stark contrast between the black and the silver coloured surface but also a striking difference in the rounded a grooved detailing too. Additionally, the inside surface comes in all black too.